World famous for his Kurt Wallander mysteries, Henning Mankell has been published in thirty-five countries, with more than 25 million copies of his books in print. In Chronicler of the Winds, he gives us something different: a beautifully crafted novel that is a testament to the power of storytelling itself. On the rooftop of a theater in an African port, a ten-year-old boy lies slowly dying of bullet wounds. He is Nelio, a leader of street kids, rumored to be a healer and a prophet, and possessed of a strangely ancient wisdom. One of the millions of poor people “forced to eat life raw,” Nelio tells his unforgettable story over the course of nine nights. After bandits cruelly raze his village, he joins the legions of abandoned children living in the city’s streets. An act of the imagination, an effort to prove to his comrades that life must be more than mere survival, cuts short Nelio’s life. 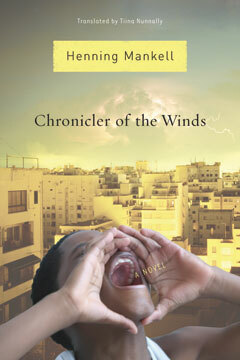 Already published in thirteen countries, Chronicler of the Winds was shortlisted for the Nordic Council Prize for Literature and was nominated for the Swedish Publishers Association’s August Prize.